There are many kinds of seals. There are Ziploc bags that seal food to prevent it from spoiling. There are seals on envelopes that keep what’s inside from falling out. But was this God’s purpose in giving us the Holy Spirit as a ‘seal’ toward His promise of our inheritance in Heaven? Why does Paul choose to use the word ‘seal’ in the above passage? Seals have been around for a long time, beginning with those created in wax. Long ago a King would seal a decree with melted wax into which he would press a signet ring that identified the King, and was worn only by the King. The seal not only identify the person making the seal by the stamp, but they often provided a legal jurisdiction. Other seals were made onto mankind himself when in slavery. These were often called a ‘mark’ and placed on the thigh of the slave as a tattoo or iron branding. The mark represented the master of the slave. The Greek word used in the original text of the above verse for “sealed with” is sphragizō (Strongs G4972). It has three base meanings. It is a seal of security, to which Strong’s adds that it is secured from Satan. It is concealment, as in the contents of a letter that is sealed until opened later. It is also to mark a person, such as the seal put upon a diploma or a legal document such as a marriage license. It is also used to prove and confirm the authenticity of something, such as the seal of a testimony or a written document. Under the first covenant, sacrificial goods such as lambs, calves, doves, etc…, to be given to God were often given a seal to show that it was dedicated to God. The items of the temple would have a seal that would show that they were dedicated to God. This marked them so that they would not be used in any other way, or eaten by the priests household. But under the second covenant, the covenant of Christ’s righteousness given to us through faith, the seal is the Holy Spirit, and the seal is within us. Rewind to Genesis 4:15. Cain kills his brother Abel, and God drives him out of the land and Cain says he will no longer be in God’s presence, and is worried that someone will do to him as he has done to his brother Abel. Then “the Lord set a mark on Cain, lest anyone finding him should kill him”. The mark in which Cain received was a mark given because of his sin. We all were once a slave of sin. In Romans 6:17-18 Paul writes “But God be thanked that though you were slaves of sin, yet you obeyed from the heart that form of doctrine to which you were delivered. And having been set free from sin, you became slaves of righteousness.” A slave to righteousness is what we are when we are saved because God has given us His mark, His seal, until the day of redemption. The mark of slavery to sin is removed, and we are now identified through the Holy Spirit, our legal seal with jurisdiction in the court of God, the highest court. It is a seal that changes our identity from being sons of Adam, as was Cain, to sons of God, as was Jesus Christ. Romans 6 goes on to say in verses 22-23, “But now having been set free from sin, and having become slaves of God, you have your fruit to holiness, and the end, everlasting life. For the wages of sin is death, but the gift of God is eternal life in Christ Jesus our Lord.” What will we receive on redemption day, when we meet God with our receipt, the “gift of God”, the Holy Spirit? We will receive eternal life in Christ Jesus our Lord – and the rewards of Heaven! 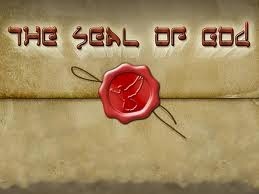 The “seal of God” has a second meaning in Hebrew language. It is the word emeth, which means truth. Jesus Christ proclaimed His own identity when He said in John 14:6 “I am the way, the TRUTH, and the life. No one comes to the Father except through Me.” Through faith, belief in Jesus Christ, we receive His Spirit, the seal of God, the truth. The purpose of the Holy Spirit is then revealed in us. In John 16:13-14 Jesus tells of the coming of the Holy Spirit and says “when He, the Spirit of truth, has come, He will guide you into all truth”, which is the purpose of His Spirit in us. He leads us in the path of righteousness, teaching us and guiding us away from our sinful nature and tendencies. But Jesus also proclaims an identity change in this passage when He says “He will glorify Me, for He will take of what is Mine and declare it to you.” What belongs to Jesus Christ will become ours through the inheritance we receive that changes our identity from sons of Adam to sons of God. Brothers and sisters in Christ, we were bought with a precious price, and have received our seal. He does lead us into all truth, and leads us in the path of righteousness “for His name’s sake”(Psalms 23:3). The mark of sin is gone! We are sealed! And upon that redemption day, we will be heirs with Christ through the Holy Spirit within us, as our legal and binding seal in the court of God. Praise be to God! YES and AMEN!